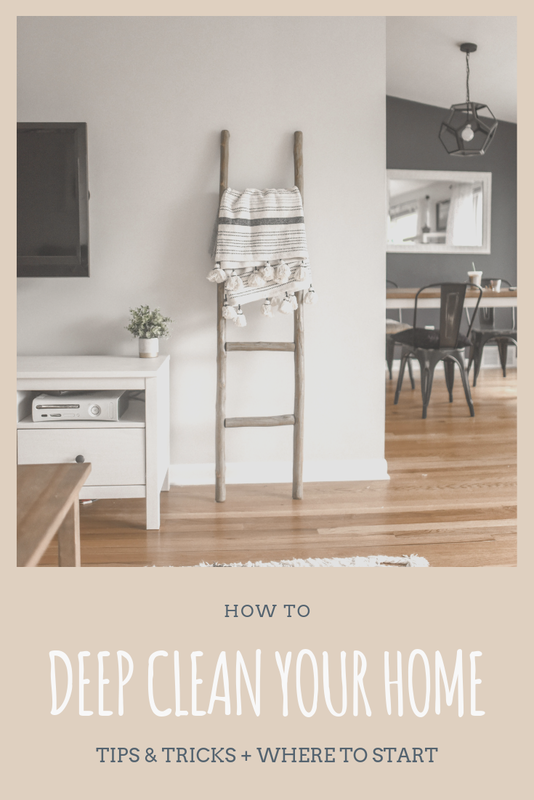 Everyone has a rough and ready cleaning routine for each week but sometimes, a deep clean is what you really need to make your home feel fresh again. This is most important when the weather outside is close to roasting and you really need a cool, calm retreat to hide in. Deep cleaning might sound like some sort of horror story if your idea of cleaning begins and ends with a damp cloth but never fear. The whole point of a deep clean is to be methodical and thorough. Do this annually and you can go back to your damp cloth for the rest of the year. The main purpose of a deep clean is to get to all the areas that you don’t normally bother with. For example, you might think that you are very thorough when you vacuum, but when was the last time you hoovered under the sofas or your bed? While the dust builds up here is out of sight, and out of mind, it could still cause problems if you don’t address it every so often. And so, without further ado, here is your checklist for a deep clean. We all take our floors for granted to some extent and while a weekly hoover will get up most of the dust, a deeper clean will help to restore your carpets, wood and tiles to their former glory. When cleaning your floor, make sure that it is as clear as possible and don’t forget to move large pieces of furniture out of the way to get those hard to reach spots. You can hire professional carpet cleaning tools if you want to do the work yourself but getting a company like Chem-Dry Carpet Cleaning in, will take a weight off your mind. The real advantage of this kind of cleaning is that it will get rid of any unwanted smells that may be trapped in the fibres of your carpet, as well as pet fur, mud and any other unlucky stains. If you’ve ever thought about replacing a less-than-perfect carpet, try having it professionally cleaned before you spring for all new. Wooden floors are a little easier to maintain as they don’t gather dust in the same way that carpets do. However, you must still treat them well to ensure their long life and continued beauty. To care for a wooden floor, you should hoover and mop regularly, using water or vinegar to remove any stains. If you notice any scuff marks, you can colour these in using a kind of crayon from the DIY store. Tiled floors only require a mop with a simple floor cleaner to return to their natural beauty. However, you should make sure that you give the same level of care to the grouting that holds the tiles in place. In damp areas such as the bathroom, grouting can be exposed to mould which can stain. Using a combination of vinegar and water should help to remove stains but for tougher stains, you might try combining baking soda and bleach. The first rule of cleaning is that you should always start with a clean slate. This means decluttering must come first. You don’t want to be wasting your time moving rubbish around to clean underneath it, after all! Decluttering is all about sorting the things you need and love from the things that are tired and ready to go. Tidying guru Marie Kondo is all about decluttering to create calming spaces and can offer a lot of tips and tricks to help you with this challenge. But if you take away one message, it is that you should love everything you have in your house. If there is no love, it has to go. Your wardrobe is probably the biggest problem area. We all have those clothes that we imagine will one day come in useful or will accommodate our expanding hips! A winter wardrobe clean out is a really good idea to get started on your deep cleaning mission as the transformation will give you the momentum you need for the rest of the house. Not all clutter has to go in the bin, though. Sites like eBay are ideal for selling on old or unwanted stuff so you might even raise a bit of cash to treat yourself once your home is in order once more. If you can’t shift your stuff online, check out your local recycling facilities for environmentally friendly solutions. For many people, ‘tidying up’ often translates as ‘hiding things in cupboards’. While this is fine most of the time, you should clean your cupboards out regularly so that whatever you hide in there doesn’t end up a dusty, mouldy mess. The first step is to empty out your cupboards and get rid of any unwanted items as you did in the decluttering stage. While the cupboard is empty, take the opportunity to have a good wipe round with an antibacterial wipe or cloth and some spray. Remove any dust and mould that may be growing and then replace the items you want to keep. If your cupboards have been exposed to a few years of neglect, you may also wish to wipe down the outside. Removing the door and its handle is a good way to get into the crevices where dirt tends to accumulate. Similarly, using a toothbrush and baking soda paste will help to get into tough spots. Cleaning shelves is a little easier but should be given just as much attention. Think carefully about how to arrange items on the shelf as you put them back to get an aesthetically pleasing finish. The kitchen is often the centre of chaos in any house but with a deep clean, it can be restored to its original state of perfection. With all the thrills and spill that happen in this room it can hardly be expected to retain its shine year round, but there are a few tricks you can try all the same. Once you have decluttered and cleaned your cupboards, you should make sure that your sink is sparkling. Deep cleaning your pipes might sound time-consuming and difficult but the reality is that you can leave some baking soda and vinegar to do the hard work for you. This kind of deep clean should really happen once and month and will prevent a build-up of bacteria and weird smells as well as slow draining water. Organizing your kitchen is, admittedly, a challenge. This is mainly because the room is changing all the time as different foods come in and out and different packets are opened and stored. However, there is a simple solution: lots of clear containers. Whether your preference is for plastic boxes or a range of mason jars, being able to see what you’ve got without an endless supply of half finished, open packets liable to fall over. The bathroom should be a clean, calm haven whether you are reclining in a candle lit bath or rushing around trying to get ready in the morning. This means that the bathroom needs to be in perfect condition. There are 5 areas to focus on when you do your deep clean: the sink, the toilet, the tiles, the grouting and the towels. As before, you can clean your pipes using vinegar and baking soda which will clear away soap scum and hair. Similarly, the tiles and grouting on the wall can be cared for just as you would the floor. Your towels should be changed regularly - at least after every 3 - 5 uses - as they can become quite a nice home for all kinds of bacteria. When your towels are clean, you should store them in a dry space rather than leave them open to all the steam in the bathroom. Folding towels and stacking them in size order is a nice way to make them presentable and easier to find. Getting into good habits in the bathroom is the easiest way to avoid having to do a deep clean. For example, you could use a shower spray to avoid a build up of mildew and should open windows if you have a particularly steamy bath. A weekly wipe down of all surfaces will also make a huge difference, and adding toilet cleaner to the cistern is a clever cheat. Deep cleaning is a yearly challenge but it is made much easier with a few good habits. The more you can do to avoid getting into a mess in the first place, the simpler it will be to clean up! If you haven’t got a system in place before your deep clean, take the time now to organize your things into a more sensible solution. This might expand your project a little bit as you realise that you need more/ better storage solutions but the time you give now will be saved in bucket loads next year.